It has been very cloudy up here for about several months now. At January 4. I was able to shoot some lights for the NGC 1499, the California Nebula. We had few hours of clear sky at February 1. I shot three hours of H-alpha light next to previous image to build a two frame mosaic. 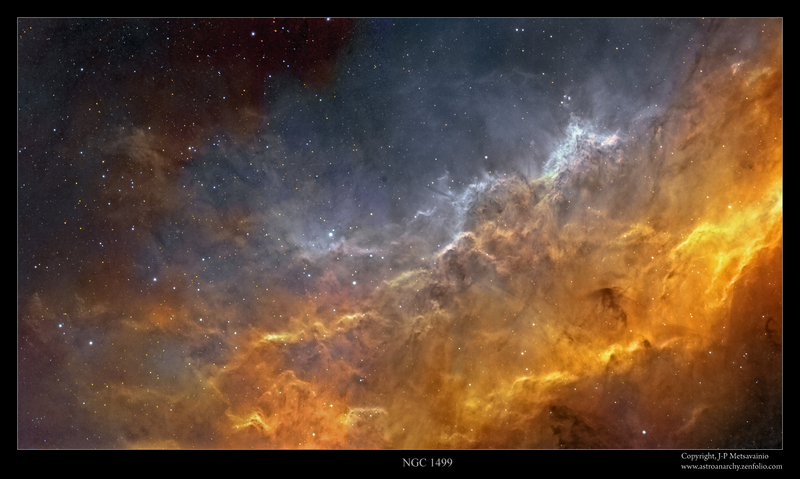 Colors are partly from an older wide field photo of the california Nebula. Image area spans about two degrees of sky horizontally. 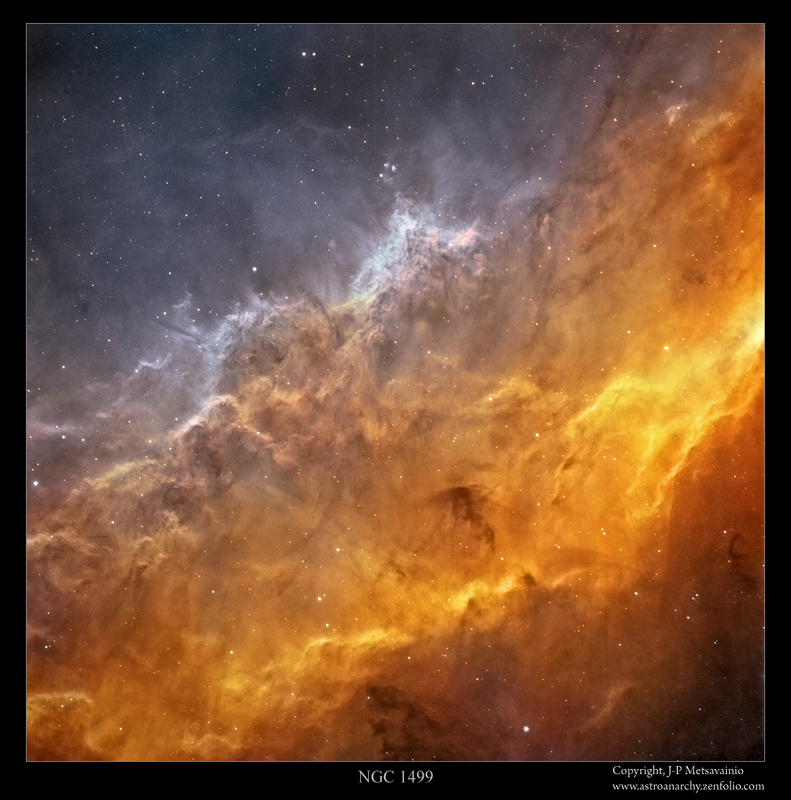 The photo is in mapped colors from the light emitted by an ionized elements, red=sulfur, green=hydrogen and blue=oxygen. A wide field image of the NGC 1499 from January 2012 was shot with a Tokina AT-X 200mm f2.8 lens, QHY9 astrocamera and Baader narrowband filter set. The white circle at lower right corner shows an apparent size of the full Moon at the same scale. (Moon has an apparent diameter of 0.5 degrees = 30 arc minutes.) This is a large target with a lowish surface brightness, total exposure time is around 30h. 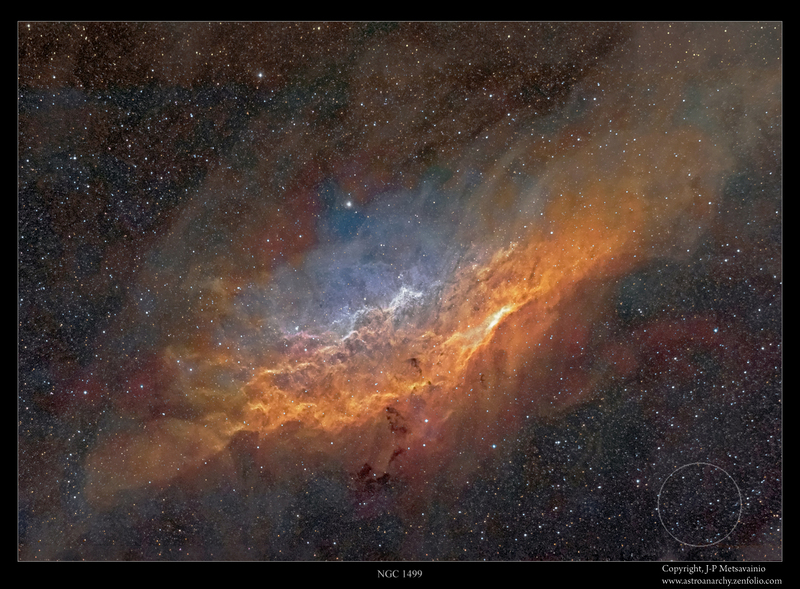 The California Nebula is an emission area located in constellation Perseus. It appears to resemble outlines of State of California on long exposure photographs, like this one. It has a very low surface brightness and it's very difficult to observe visually. 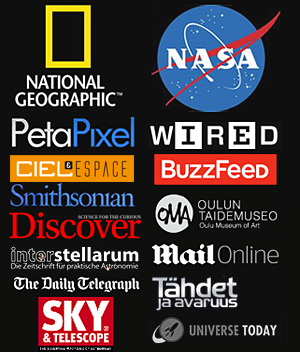 Distance from my hometown Oulu, Finland, is about 1000 light years. this image spans around five degrees horizontally. The Wikipedia article states, that the angular size is about 2,5 degrees (Five full Moons side by side) but as can be seen in this image, the actual size, with a dim outer parts, is much large. The left side of the two frame mosaic at top of the page was shot at At January 4. 2016. Part of the S-II and O-III signals are borrowed from the older wide field photo.